1n my ICT4D circles, everyone knows I am a fan of low power processors, the raspberry pi-style micro-computer movement, and solar PV-powered computing. My other major interest area is green data centers. More fascinating still, however, is the imminent convergence of all of these things. I believe that in the near future, micro-computing will intersect with the data center industry. We will see the rapid emergence of micro-data centers (mDC & μDC) where system efficiency, very low power consumption, and edge computing are paramount. Microsoft Research distinguished scientist Victor Bahl predicts “As mDCs become popular, enterprise IT pros will most likely have to deploy them on premises as cloud accelerators for the services their users depend on. As users come to expect and rely on the high performance and new applications enabled by mDCs, IT pros will be expected to monitor and manage these servers 24x7x365.” This is a very powerful statement, as it would see the data center market reversing years of the trend toward centralization and promoting the bigger-is-better ideal for data centers. These new micro-data centers will take many shapes and forms, but I would argue that it is the Raspberry Pi style micro-computers that will shape and form what the micro-data center market will evolve into. This past summer, my organization, Inveneo, in conjunction with ARM, Ltd., ran a solar powered micro-data center design challenge, as a way to inspire computer hardware engineers to move into this micro-oriented space and direction. Over 65 teams entered from across the globe with some very interesting designs. These micro-computers, or what I will now call micro-servers is a new segment for micro-computers, are the same Raspberry Pi sized boards with ever increasing memory, CPU cores, and yet very low power consumption—usually on par with the power usage of today’s smartphone. The next big leap, which is almost here, is the jump from 32-bit processors—the mainstay of today’s raspberry pi type boards—to 64-bit versions with 4 cores, 4gb of RAM, and dual port gigabit Ethernet. Now, does that not sound like the modern data center server? Once these 64-bit versions come online in mass production, they can be used just like today’s servers, and the server market will need to sit up and take notice—very quickly. We are seeing ARM-licensed CPU semiconductor firms like Actions (CN), All-Winner (CN), Broadcom (US), Qualcomm (US), and Hisilicon (CN) racing to bring the new low power 64-bit CPU versions to market, competing for this market with the micro-server board design companies. Interesting on a geo-political front is the design race here between China and the USA. 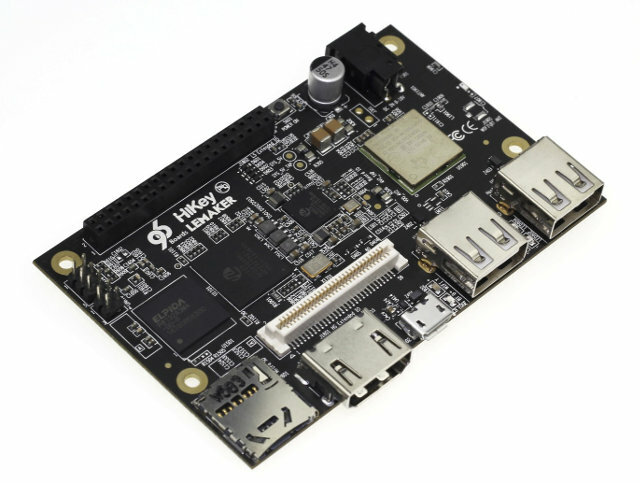 Recently at the 2015 Linaro Connect conference in San Francisco, I sat down with Lemaker’s (CN) co-founder, Leo Liu, who shared their latest 64-bit reference board. Their reference HiKey board was sporting an 8-core 64-bit ARM processor from Hisilicon, 2 GB ram, and 4GB eMMC Flash Storage. I predict we will see many more of these 64-bit ARM based “micro-servers”, coming by year’s end. The key difference with traditional servers vs. micro-servers will be the very low power footprint of the micro-server board. We will be able to combine 10 of these boards in a single housing and still use less than 40 watts of electricity and be able to incorporate passive cooling. Add a stack of SSDs and a switch and you have micro-data center. Today, there are over 53 companies producing Raspberry Pi sized/style boards: http://linuxgizmos.com/raspberry-pi-stays-sky-high-in-2015-hacker-sbc-survey/. I expect some very interesting movement toward the end of 2015, as a few key companies will move from being just another Raspberry Pi knock-off to focusing on this new micro-server market, moving away from being a general Linux machine to having a high performance 64-bit server board with a very small energy footprint. Convergence is coming in the server market: low power consumption, server miniaturization, and edge networking are leading the data center industry to a small-is-beautful!